It came to pass in the time of the God-loving Emperor Theodosius of glorious memory that on the first day of his reign he saw a marvellous thing, he saw Saint George come from heaven with great glory and the archangel [Michael] with him, and he seated the God-loving Emperor Theodosius upon the throne of the Romans, and his faith within him was strong in Saint George all the time [of his rule]. And when he had reigned twenty years he built a large church to the name of Saint George, and he gathered together all the bishops to the consecration of the church of Saint George, and he sent for all the bishops and even for my feeble self, a weak old man. And when we had consecrated the holy church in the name of God and of Saint George, the precentor (?) sang the psalms in their proper order, and the emperor and his nobles and the whole city were with us. 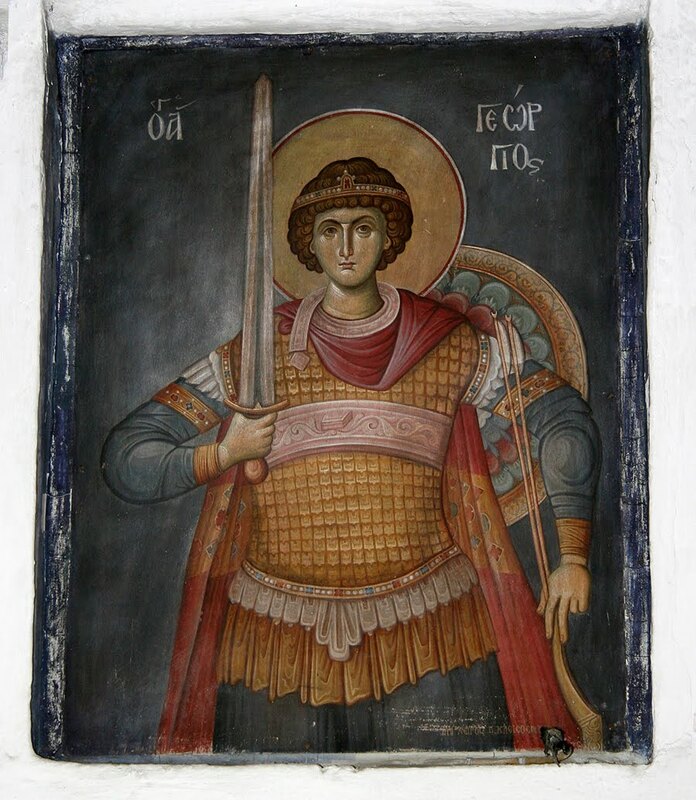 And after the emperor and the whole multitude had sat down, he commanded the martyrdom of Saint George to be read, for that day was the twenty-third of Pharmouthi [April], and we listened breathlessly. But when the reader came to that place where God testified to Saint George, saying, "There is none like unto thee among all the martyrs, neither shall there be any like unto thee forever," the subject puzzled me, and I said, "Since so many generals and eparchs and governors of this world have forsaken all the glory of this world, and their rank, and wealth, and have died for the name of our Lord Jesus Christ under the impious and lawless Emperor Diocletian, how can this holy martyr be more exalted than they all?" When we had celebrated the Holy Communion and the evening had come, we lighted a lamp for the emperor, and lay down to sleep, and neither the emperor nor any of the others did eat, but he slept with us in the holy church. Now it was the evening of the Lord's Day, for the consecration of the church took place on the Sabbath day. And when the night had come and we had, as was meet, performed the office for the night, and had said, "Amen", we sat down to speak of the mightiness of God, and the emperor came with us. And one of our fathers, a bishop, was taken up to heaven in a vision, and he saw most exalted mysteries of which it is not lawful for an earthly being to utter. He said: "I saw that I was standing before the throne of the Father, and I saw thousands of thousands, and myriads of myriads praising the Holy Trinity, and coming in bands, and they worshipped God, and glorified Him and blessed Him, and made their requests, and afterwards they stood in rows, and no earthly creature could describe the glory and the great honour which they had received from the Trinity. And I saw one coming forth from within the veil like unto a king wearing a diadem of gold with seven crowns upon it, and he was riding upon a white horse, and he was many times brighter than the sun, and was equipped with sword and armour and the apparel of a king; in short his kingly dignity was immeasurable. And when he came forth a mighty multitude followed him on this side and on that, and I saw all the saints bowing down before him, and when I looked I was speechless, and I wished to know who he was. 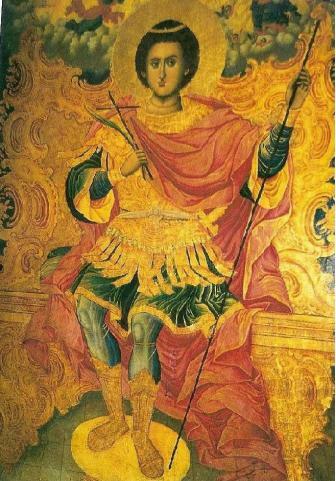 And I looked on my right hand and I saw a monk standing having wings like an angel of God, and he wore a kingly crown and raiment the like of which there is not among the kingdoms of the world, and he had a golden staff in his right hand, and his face was full of joy, and great glory surrounded him. And I besought him, saying, 'My father, I beseech thee to show me who thou art that art in such honour as this.' And he embraced me and said to me, 'I am Paul of Tamma, and well hast thou come, O shepherd of our true King, our Lord Jesus Christ;' and when he had said these things to me I rejoiced that I had found freedom of speech before him. And I said to him, 'O master, my holy father, inasmuch as thou hast deemed me worthy of thy holy salutation, I bessech thee to tell me who is this great king that has just come, to whom all this multitude has bowed the knee?' Then the blessed man broke into a spiritual smile and he said to me, 'Knowest thou not who this is?' And I said to him, 'O father, how should I know who this is since I have never seen him before?' 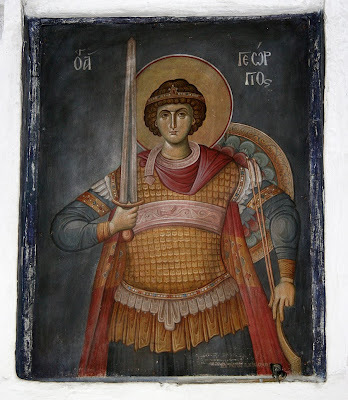 He answered and said to me, 'I have been sent to thee to make thee certain of the things which thou didst ponder over in thy heart yesterday in the church concerning Saint George, the beloved of God, the chosen martyr exalted above all the saints according to the words of our Saviour. The works of every soul which comes forth from the body, whether of righteous men or whether of sinners, are manifested forth on the spiritual tablet and the soul is in its presence always, and its deeds are written upon it. When it pleased my Lord Jesus Christ to take me, His servant, to my rest and to visit me, I came forth from the world, and He esteemed me worthy of His goodness, and He brought me into His city, and I saw this being whom thou hast seen. And he had on this royal diadem with seven crowns above it, and I looked upon it and read the writing which was upon it, which said, I am George of Melitene, from Diospolis, who died three times for the name of our Lord Jesus Christ, and I saw all the saints bowing their knees before him. Now I had endured many sufferings for the name of our Lord Jesus Christ and died four times, and I said within myself, Behold, I am equal to him in honour, and I refrained from bending the knee to him. And straightway, in a moment, He who knows the hearts of all men sent the Archangel Michael to me who said, O excellent Paul, why hast thou not taken part in the spiritual salutation according to the command of the Almighty?, and I told him what was in my heart. Then he took me immediately to the holy Apa Noub the Confessor, who had been both a monk and a martyr, and he showed him the command of God. The holy confessor said to me, O Paul my holy father, go and perform the command of God, and say not, I have suffered like the mighty George, for thou, of thine own free will, [didst suffer] greatly; but that just man did for God's sake suffer by axes, by double edged hatchets, by saws, by nails, by fire, by two edged swords, and by the mouths of wild beasts. And I say unto thee, O my beloved one, that when the attendant cometh and sayeth unto thee, 'The Lord calleth for thee, come,' is not thy going better than seventy years of a monk's life in his cell?' When I heard these things I changed my mind through the words of the archangel and the holy man and I said, 'Forgive me'; and they rejoiced with me, and I went to the holy nartyr of Christ and straightway made obeisance before him. [And the holy man said], 'O faithful shepherd of Christ, console thyself, for there is no one like unto thyself among the martyrs who are crowned [except] Saint George himself.' And while the holy man (Paul of Tamma) was talking with me, Saint George the soldier of Christ came up to me with his face beaming with rays of light, and he saluted me and filled me with joy and gladness, and said to me, 'When thou goest to thy city Ancyra, build thou a temple to me in it, that I may come and dwell with thee, for it will be one hundred and five months before thou shalt come to me in this holy city.' When he had said these things to me I rose up straightway from my vision.'" When the emperor and the twelve bishops saw the radiant face of that bishop they knew that he had seen a revelation, and they entreated him to tell them what he had seen. And he, as his mind came to him, told them all the vision he had seen, and they marvelled greatly, and glorified God and the holy martyr Saint George. And the emperor answered and said, "On the day when God seated me, unworthy though I be, upon the Roman throne, I saw with my sinful eyes, Saint George with glorious visage come from heaven holding a sceptre of gold in his right hand, and the Archangel Michael was with him. And I saw a diadem of gold and seven crowns upon his head, and he shone a thousand times brighter than the sun, and he came to me filled with joy, and took hold of me, and seated me upon the imperial throne, and a number of the nobles of the army saw him face to face. And I saw him again in his holy church and he showed me things that would do good to my soul." Now when I (Theodotus) heard these things, I blessed my Lord Jesus and his holy martyrs. After these things that bishop went to his city and built a beautiful church in the name of God and Saint George, and consecrated it with his own hands before he came out of the body. Now that bishop was one of the three hundred and eighteen bishops that were gathered together in Nicea; and he filled the office of bishop for seventy-five years, and he died in God when he was one hundred and eighteen years old.